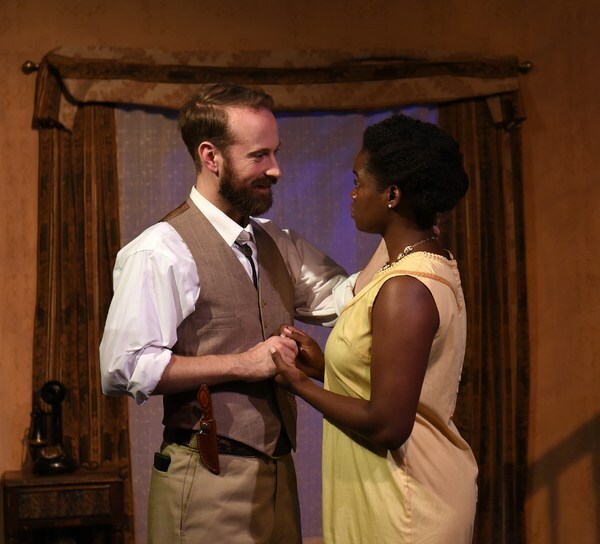 The Dark at The Top of The Stairs by William Inge holds a universal theme– life is hard, love is hard, but if you have the right people it’s all worth it. Directed by Jerell Henderson, it focuses on a family of four; a begrudged father, an abiding yet willful mother, the bratty younger brother and his closed off sister. We live in their home, more specifically their living room, for the entirety of this three-act production, it is littered with decor bringing an added authenticity to every moment (set design Sam Rausch). The play opens with an explosion of sound designed by Eric Backus, Rubin (Chris Daly) and Cora (Anesia Hicks) already at each other’s throats. Despite it being the 1920’s, Cora seems to be able to hold her own against Ruben’s growing wrath. At first glance I immediately took note of their racial differences, especially given the time. Rubin is white, Cora is black. It seemed this detail only lived visually, it was never verbally touched on and this pleased me. In a way I suppose it does go against the social mores that often accompany scripts of the this era and to speak to that would be to truly capture the essence of the period. To lowlight this “detail” and simply treat it as fact–not dismissing or ignoring–but simply normalizing, is a strong choice. This choice also begs many questions during the production that force the viewer to formulate their own answers. This seemingly strained relationship between husband and wife, trickles throughout the family as the children don’t actively take to their father given his prolonged absences. This creates a simple division that allows us to easily forget about Rubin until he comes back at the very end of the play. It doesn’t end there, you guessed it, siblings Reenie and Sonny don’t get along too well either. Reenie’s going to a ball and her mother’s spent a lot of (Rubin’s) money on a dress for it because she never goes to things like this, but they’re not telling Rubin what the money is for, causing more disarray between the family. Reenie’s date to the ball is a young Jewish boy named Sammy, bringing our first true mention of race into the story. Given the racial dynamics presented at the top of the play, despite a strong performance it made Zachary Alexander’s character seem less essential than it may have in an all white version. We’ve already got a multi-racial family, why would the presence of a Jewish kid be so problematic? Sammy’s plotline and adversities seem to take this tale off its tracks and into a new play of its’ very own. You already have the story you need at the top of the show, a family, a biracial family at that, in the 1920’s. They’ve got a bratty kid that is consistently bullied and is indifferent to his father, an introverted daughter with a desire to party and a general inability amongst the family to not raise their voices at each other. That right there provides a fruitful and compelling journey to love, in life, between the spouses, between the siblings, and throughout the family. It became clear to me, somewhere nearing hour two that there is nothing really that exciting or harrowing or unique about this play that warrants three acts. This show is full of laughter, life, and even love. There are such strong moments in Jerell Henderson’s direction that it left me wondering if the weaker ones are even a part of the same production, and that is what constantly took me in and out of the story. Aneisa Hicks’ performance is one such example, she consistently demanded respect while maintaining a mother-like love through her authoritative energy, but at other times she felt awkward and misplaced in her blocking. Nevertheless, The Dark at The Top of The Stairs persists, but I would suggest just taking the escalator, it’s a helluva lot quicker. The Dark At the Top of the Stairs is produced by Eclipse Theatre Company and runs through December 16th at at the Athenaeum Theatre. Eclipse ensemble member Zachary Alexander (Sammy), with guest artists: Sarah-Lucy Hill (Lottie), Aneisa Hicks (Cora), Chris Daley (Rubin), Destini Huston (Reenie), John Arthur Lewis (Morris), Hilary Schwartz (Flirt), Tony Rossi (Punky), Davu Smith and James Leonardi (Sonny), Jake Drummond (U/S Ruben and Punky), Anna Civik (U/S Reenie & Flirt), Jalyn Greene (U/S Cora), Sarah Rachel Schol (U/S Lottie), Justin Tsatsa (U/S Morris), and Cari Meixner (U/S Sammy). Eclipse ensemble members Zach Bloomfield (Casting Director), Celeste M. Cooper (Casting Associate), Anthony Conway (Casting Associate), Ashley Bowman (Production Manager), Kathleen Dickinson (Production Manager), Rachel Lambert (Props), Kevin Scott (Co-Producer), and Nathaniel Swift (Co-Producer), with guest artists Jerrell L. Henderson (Director) Eric Backus (Sound Design), Caitlin McLeod (Costume Designer), Sam Rausch (Set Design), Cassandra Kendall (Lighting Design), Spencer Fritz (Assistant Stage Manager), Natalie Wagner (Stage Manager), Rachel Flesher (Fight/Intimacy Choreographer and Assistant Director).